To many Scotch whisky enthusiasts, No Age-Statement (NAS) whiskies are an emotive topic, write Andrew Glynne-Percy and Leon Kuebler for WhiskyInvestDirect. A NAS scotch is simply a whisky which doesn’t bear the age on the bottle. By Scottish law, a Scotch whisky can only state the youngest whisky present in the bottle. For example, a bottle could contain 12 year-old, 8 year-old and 3 year-old whisky, but it would only be classified as a ‘3 year-old’ Scotch. The choice of stating or omitting the age of a Scotch dates back to at least the nineteen century. While some blenders in the early twentieth century used an ‘average age’ statement, this has long since been illegal. 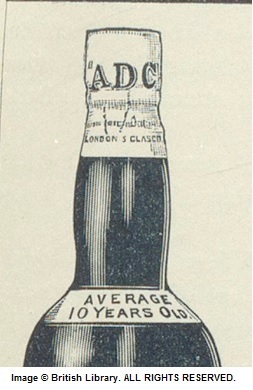 A 1905 advertisement for ADC Liqueur Scotch - "Average 10 years old." Such descriptions are no longer permitted. In recent decades, single malt whiskies have generally displayed age statements, while many blends have remained without a stated age. Depending on who you listen to, the resurgence of Scotch whiskies lacking an age statement is due either to advancements in the science of maturation, or a shortage of aged stock. There is little doubt that aged stocks have reduced in recent years. Stocks of malt whisky older than 11 years have been declining by an average of 6% per annum since 2011. If a distiller bottles a 12 year old Scotch today, it was placed in the barrel in 2003 or 2004. Unfortunately, they can’t go back in time and make more. In theory, NAS whiskies should enable greater flexibility and complexity in the spirit of innovation. Distillers are no longer confined by age, therefore gaining the freedom to introduce new flavours through the influence of wood, distillation methods and time factors. At the same time, the option of including good younger whiskies means that stocks can be left to mature according to each barrel’s needs, rather than meeting an arbitrary age. A diverse range of distillers have embraced NAS whiskies. Macallan, the third-largest single malt brand in the world, has been one of the leading advocates of NAS whiskies for many years. Arran is another distillery which aims to maintain a balance between NAS and age-statement whiskies. As Arran shows, support for NAS Scotch is clearly not limited to well-established distilleries running low on aged stock. Arran distillery is, at 21 years of age, a relative newcomer in Scotch terms, and barely of legal drinking age in most countries. To any drinker, it is obvious that the taste of a whisky matters more than its age. Age is only important as an indicator of the quality of the whisky. Just like any supposedly ‘superior’ whisky with a number on the bottle, there are good ones and there are bad; a 12-year-old is no guarantee of quality if the whisky was filled into exhausted, third-fill casks. 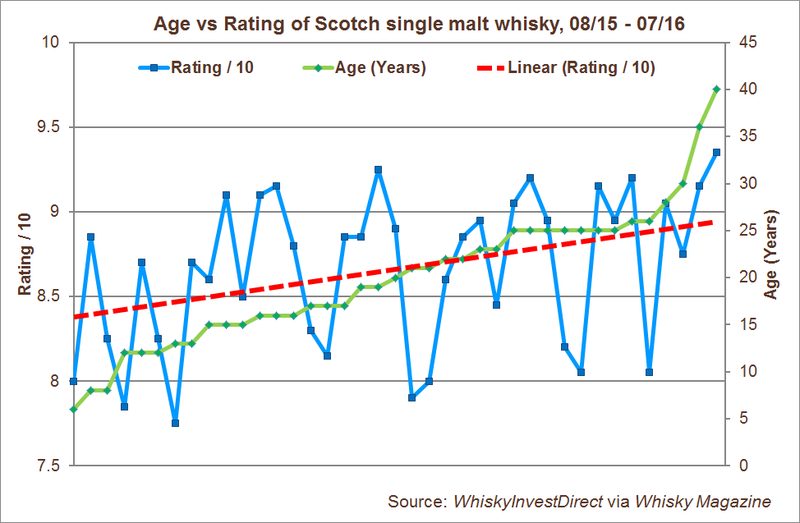 Reviews of single malt Scotch whiskies in Whisky Magazine between August 2015 and July 2016 confirm that age is a good indicator of quality – but not a perfect one. Whiskies of 6-12 years of age were capable of scoring as high as far older whiskies. This chimes with Oliver Klimek’s analysis of the 2014 Malt Maniac Award winners, which showed that age did tend to improve whisky – but exceptional younger whiskies were capable of very high scores. With this in mind, we compared the ratings given to the NAS entry-level single malt (defined as the least expensive regular bottling available for <£60) for 40 distilleries with those awarded to their age-statement counterpart by WhiskyFun.com. WhiskyFun.com is the blog of Serge Valentin, who has reviewed nearly 12,000 whiskies since 2002, and is generally regarded as one of the most impartial reviewers, even if he readily admits to his own preferences in style. 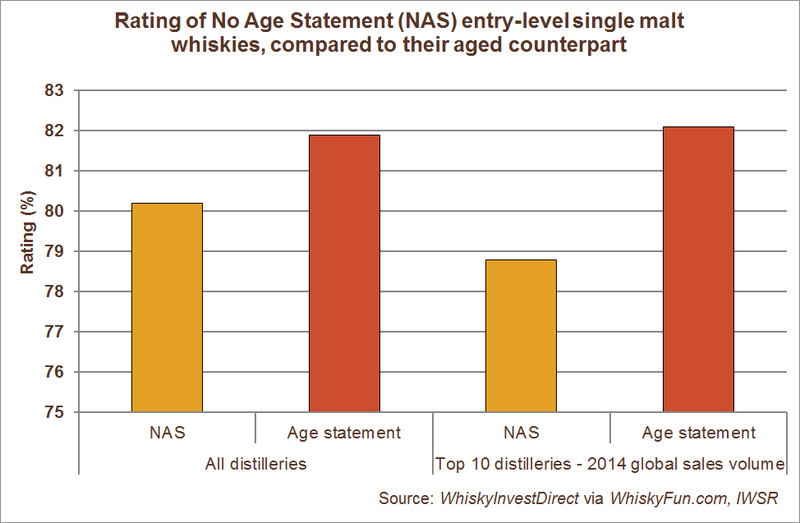 As the chart shows, entry level single malts with age statements generally outscored their NAS counterparts, although the gap was not too large. However, the gap widened considerably for the most popular single malt brands (as of 2014, these were, in order of global sales volume: The Glenlivet, The Glenfiddich, The Macallan, Aberlour, Glen Grant, Laphroaig, Glen Ord, Talisker, Cardhu and Bowmore. Source: IWSR). These results included ‘cask strength’ whiskies – those with alcoholic content in excess of 46% ABV. When only standard (i.e. 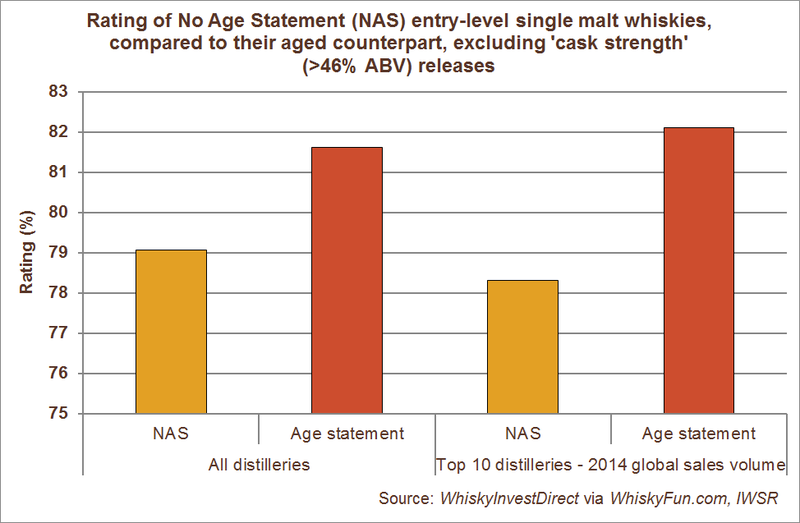 non-‘cask strength’) bottlings were included, the gap between NAS and age statement whiskies increased. This was less true for the major single malt brands, as their entry-level releases tended to be 40%-46% ABV. The above suggests two trends may be ongoing with NAS whiskies. Firstly, the NAS releases of major distillers are not only generally lower ranked than previous equivalents with age statements, but they also compare unfavourably with those of smaller distillers. Since most consumers probably first encounter NAS whiskies from the major single malt brands, it is likely that this is colouring their view of the category as a whole. Secondly, the clear increase in the overall rating of NAS whiskies when cask strength bottlings are included show that innovation without age statements can work. After all, Aberlour A’Bunadh has been going since 1998 without too many complaints from committed whisky enthusiasts. While cask strength whisky may not be to everyone’s taste, this is certainly worth bearing in mind. The issue with NAS whisky is not the concept, then, but rather its application. Good whisky is possible without an age statement, and the inclusion of younger whiskies need not necessarily debase the product. Yet some distillers – particularly the smaller brands – appear to be making better use of NAS than others. For a better debate on age statements, perhaps the category deserves re-appraising by both distillers and consumers alike. A student of Business and Marketing at Bath University, Andrew Glynne-Percy is currently working as a research assistant at WhiskyInvestDirect. A keen fan of Scotch, the industry's history and its investment potential, Leon Kuebler is Operations Executive at WhiskyInvestDirect, the online platform for buying, owning and trading whisky at low cost as it matures in barrel.